I recently participated in a charity sewing event, and I brought my serger to use for the day. I was so amused by my fellow sewists’ reactions to my conebobbinspools of thread that I had to create a tutorial. Let me back up… As many of you know, when you first purchase a serger, one of the investments you make is in the thread. While one cone isn’t going to break the bank, buying four of them each (in oodles of colors) will definitely start to add up. Not to mention sorting out the storage of said cones. I do keep four cones of the most frequently used colors on hand, but when I decided to round out my collection, I knew there had to be a workaround. I found several techniques online, and then I did my own thing based on a mishmash of these ideas, incorporating my needs based on the machines I have. Now, I only buy two cones of the colors I’ll use less often, and I use this technique in place of the other two. And actually, you could buy only one if you just want the color for a project or two. I know I’m not the only one doing this type of thing, but since it was new to my friends that day, I assumed it may be unknown to some others as well… so here it is! *I’m sure any empty spool would work. I use this one because it stores easily (see below), it is almost the exact width of the bobbin, and I have a lot of them. 1) Apply hot glue around the edges of the top of the empty spool (opposite that rough ridge where you secure the thread). 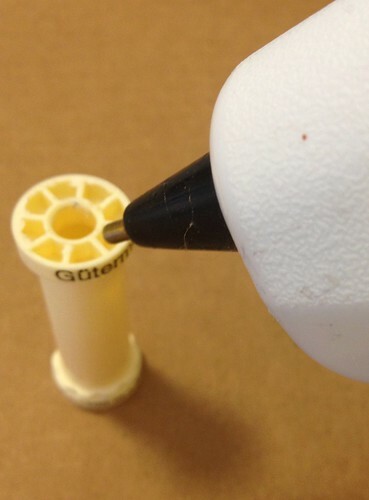 Be fairly generous with the glue to fill up those outer holes, but avoid getting it into the center hole of the spool; that needs to remain clear. 2) Press the bobbin onto the spool, so that its center hole is aligned with the spool’s. Hold it for a couple of seconds until secure. Then, reinforce the attachment by applying a little more hot glue at the holes, if the bobbin has them like this one does. 3) Place the newly minted combo on your winder, with the bobbin locked in, if applicable, just as it would be if you were about to wind a bobbin. 4) Set the cone on the table next to your machine for the moment. Secure the end of the thread from the cone onto the spool (not the bobbin) and wind it around a few times, in the same direction that it will continue to wrap when you press the pedal. Don’t put the thread through any of the channels in the machine that you normally would — the thread will go straight from the serger cone to the spool. 5) Hold the cone of thread in one hand, grasping the bottom of the cone as to not get in the way of the thread. Start to lightly press the pedal. 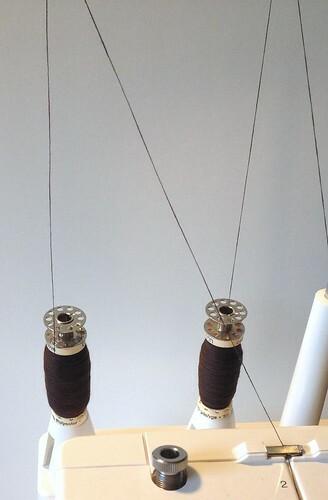 With your other hand, guide the thread, moving it slowly up and down the length of the spool as it winds, keeping it evenly disbursed along the spool. You can pick up speed as you’re comfortable, but it will be easier to control if you don’t max it out. Keep it up until the spool is as full as you’d like. 6) Clip the thread between the cone and the spool, and you’re done! 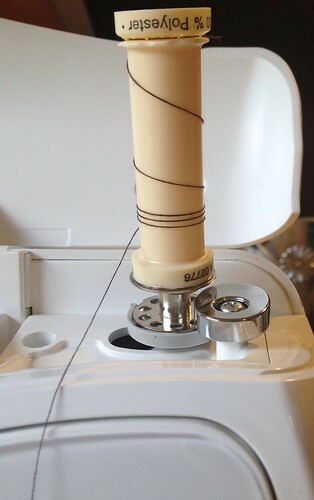 One last thing — if you are using a Gütermann spool like this one, place it on the serger right side up, with the bobbin on top. If you do it the other way, as the thread feeds through the serger, it can get snagged on the rough ridge at the bottom. Thanks for the demo, moonthirty, great pictures and a cool video. Having to buy all those cones of thread has been one of the main reasons I haven’t bought a serger. Maybe I’ll consider it now that I know a workaround. That is a great hack. I purchased a special bobbin serger holder that holds bobbins on the serger so you just fill 4 bobbins and then thread your machine. It works great. There are so many handy persons who make these in their little wood shops, mostly retired husbands full-filling their wives sewing needs. Find it works and they go to craft fairs, farmer’s markets, etc I usually pay $5-8 for them. This is brilliant. What a time saver and so convenient. Mrs.Kelley Bates,Baltimore Co., Md. Love your thread hack, will have to try it sometime when I run out of serger thread!! You just made my day! What a great idea. I just pulled my serger out of storage to get reacquainted and dreaded the idea of buying more thread. I’ll definitely be doing this instead. Kim, I was elated as well. This idea is absolutely brilliant. I love all time saving and just better ways of setting up and organizing my sewing. Thanks, Mrs. Kelley Bates, Balto., Md. So I’ve been serging for years and I only have three sets of colors – black, white and gray, and I’ve only used the gray once, ha! Yeah, I’m way too cheap to buy four cones of random colors! 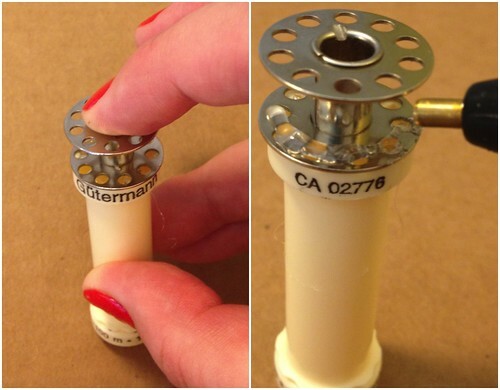 I had to immediately go and check this out and I found out that if I use the same kind of Gutermann spools that you used I don’t even have to glue a bobbin on top, it can fit right on my machine’s bobbin winder and spin! Sweet! i am new to surging. how does this work then? How does it work…. it works great only have to buy the smaller spools … The surger with White thread, I use to finish all the light colored costumes. I most usually cut out the costume, then surg all the edges of the pieces before I put the costume together… every cut edge is surged. The black thread is for the material that is dark…. When the 2 machines are used as dark and light…then I use the large cones. Will you do a review on your serger? I am considering buying this model for my daughter, but they are not sold locally and I’d appreciate knowing from someone who has one. I have a Viking, but I can’t afford to buy her one of those right now. Thanks in advance. Hi, I have had this serger for 4 years and I love it. It has more features than one I had from New Home (Janome) and at about a third the price. You can find these at walmart.com or amazon.com. I also think you can purchase extra feet at either place. When researching a replacement for my broken Singer serger I knew it had to be easy to thread. I also have the Brother 1034D and it works for me. Doesn’t do everything that some do the sewing tv shows do, but i’m a happy camper. My daughter went through the same research and ended up with the same. Love this idea! I have a whole drawer full of cones of thread, but often have none to match a particular project. I will be using this idea for sure. What a great idea-thanks for this tutorial!! Love the idea! Thank you for sharing. I have lots of plastic bobbins, so I will use them up. Great idea, I mostly use white for everything but this is really would be a help when you want something spacific. How clever are you? I’ve been winding mine on a bobbin winder because I weave also. I LOVE this idea! Thanks. This is the best idea ever! I’ve always wanted something like this. Thanks for sharing! This is a fab idea. I have been sewing for years and I have never heard this before. You should submit it to the magazines, You will probably win a prize. Keep up the good work! Thank you so much for the thread economy tip – great idea. I am constantly amazed and delighted with peoples’ generosity on the web – makes me smile!!! I use both serger thread and my sewing thread and my embroidery thread in my serger. I don’t really see the point of winding an empty spool of thread from a spool of serger thread and with the amount of serger thread I use I’d be winding every day. I’ll stick to the serger spools unless I need a certain color or type of thread. But I have to say, it’s a very good idea! To make a smoother wind, you can put your cone with thread on your serger and wind off of it. This way you don’t have to hold your cone while winding your spool. Just slightly guide with your fingers. Cool idea,i admit i only have black and white as i use most of my serging inside the garment im making.A friend of mine had her hubby buy her a serger from sears and she just found it way too complicated so she returned it and i let her try my brother 1034D and she was converted )We bought both from ebay. I just found this! What a great idea. I’ve been free motion quilting and was looking for a way to get thread off of large quilting cones to something bigger than a bobbin. I’m going to try it with my sidewinder. I’m new to serging and wondered how come you can’t just put a regular spool of thread on the serger? I have a Singer Ultralock 14U34. Thanks, I’ve had the plastic cones to break on 2 spools of serger thread. Now I don’t have to trash them. Thanks so much for great idea!!! I did this and it works GREAT! I am always up for frugal ideas using items you have to upcycle into something useful! What a cool idea! I use really old (30 years or more) serger thread for all the hand basting I do on wedding gowns and change colors for each subsequent fitting like first fitting, red, second fitting (hopefully final) green and so on to keep track of which thread tracing is the correct one. Your hack would also work if you wanted to use up the remaining serger thread of an odd color in the machine by using an upright thread holder. Love your creative thinking! The different colors of thread for different sets of fitting/alterations — what an AWESOME idea! I’m totally going to use that. Thank you!! This is excellent idea! I was using just bobbins but this is even better! Great! Thanks! Thanks Beata — occasionally I do use just bobbins on the needles if it’s only for one project, but they definitely don’t last long at the loopers! THAT’S SUCH A GOOD IDEA. A FRIEND OF MINE GAVE ME A SERGER BUT I HAVEN,T BEEN ABLE TO BUY ALL THE THREADS SO I ‘M TRYING THIS. THANKS FOR THE IDEA AND THE COOL VIDEO. Hello, thank you very much for taking the time to write this “hack”. Beatrice. Thank you so much for sharing such an amazing idea. I just bought a massive reel of good quality 180 weight monofilament thread that quilters usually use on long-arm machines. Would I be able to wind this using your method? I want my 2 thread flatlock to be near invisible on my serger, hence I need a second reel of monofilament thread. Thank you for sharing your idea! I just got my first serger for my birthday (61 yrs old) and was searching for serger thread vs. embroidery thread. Google brought your site up, I watched, I am hooked on your idea. Now to get an empty spool……. Oh, I wish I could give you some of mine!! :) I hope the hack works well for you. Enjoy your serger and happy birthday! Small guterman spools only hold a bobbin’s amount of thread. Do both of the loopers use a lot more thread or just one of them, it seems that one of my cones empties out a lot quicker than the other, but it has been a while since I used it, and I can’t remember which one it is? This is going to save me, and be fun, at the same time! Thanks for sharing…it’s brilliant!!! I too am just beginning on my serger. I was concerned not only over buying a lot of cones but also storing them. I use normal matching thread on the needles although I only really need matching thread in the left hand needle if the seams are on the inside. I don’t like the solution of just using white and black because the contrast is too great with most fabrics. I bought 2 light grey and 2 charcoal. Charcoal worked great with dark purple and dark green, and the light grey worked fine with a light lime green. At a glance you don’t even notice that the looper thread is grey because the tone is the same and the grey doesn’t provide much contrast. I will get more cones but I don’t expect to need much variety. I may have to get a beige and a medium brown eventually but so far all my projects are working great with the range of greys. I bought three cones of gray and use regular thread in the needle when I bought my machine recently. Gray does seem to work with lots of fabric. Thanks for your suggestion of the range of grays. I’m going to purchase some charcoal. Thanks! Great ideas on the color grey. I have a Baby Lock Imagine which is so easy to thread but it’s usually threaded with white. I’m all for using grey shades now. Thanks! I bought the Baby Lock Evolution – amazing threading. I hated threading and also messing with tensions in my previous machine. This is a dream. I usually buy just two spools of various colored serger threads, and stock up on black and white. I thread the upper and lower loopers with the thread colors to match my fabric, and either the white or black depending on the color of the fabric. I find this saves me money in the long run. ho j adore l idée on a donner a ma mere des tas de cone industrielle et on s’en ai jamais servi ne sachant pas comment et n ayant pas de surjeteuse mais la on peu meme s’en servire sur un mac normale merci bcp. I just bought my first serger but haven’t bought the thread yet…as you mentioned, it can add up quickly. I was just searching the internet to see if I could use an all purpose thread on my serger and I found this tutorial instead. Great idea! Thank you so much for sharing, you just saved me a lot of money, and undoubtedly the headache of jamming my brand new machine with the wrong kind of thread! I received a serger as a Christmas gift and its still in the box, it’s intimidating. Your “hack” as you call it has given me the push to get going. I have an embroidery machine and I’ve invested a small fortune in embroidery thread, so I’m thankful for this tip. Thanks!! Purchase thread from joann when it is half price. Wawak has great prices on Maxi-Lock. this is a really great idea! Thank you so much!! I had extra large spools and haven’t used them for months because I didn’t know what to do with them. Now I do! Thank you so much! That is awesome! I am trying to edge a unique color fabric that I finally found a regular spool of thread in a matching color, but certainly no cone thread on that color. I certainly needed a hack! I didn’t know that! Thanck you! What a good idea! I had the same qualms about buying lots of cones of thread–the storage as much as anything; those things take up a lot of room! One idea–I never seem to have enough bobbins; I’m not sure about tying up bobbins to store serger thread. I think….if I did this I’d either use poorer quality bobbins, or I’d just pop the bobbins off and then reattach them as needed. I use a mason jar to hold my cone thread when i need to coordinate colors with my sewing machine. how do i change colors for the thread on the serger without changing all the thread? new to surging. This is fantastic. I was given a large tote of cone spools and some of them had started losing their thread and I had no idea how to salvage them. You are a genius! I see by the dates of most of the comments you’ve been at this for awhile. Me and my serger Love you. Thank you! This is a great tip! I created one with toothpicks. That’s so cool. Going to try it. Whoooo hooooo, who knew? Awesome lesson! Been sewing & serging for 30 years and never thought of this or heard of it anywhere else! Thanks so much!! This is amazing – – thanks so much for sharing. Will give it a try. 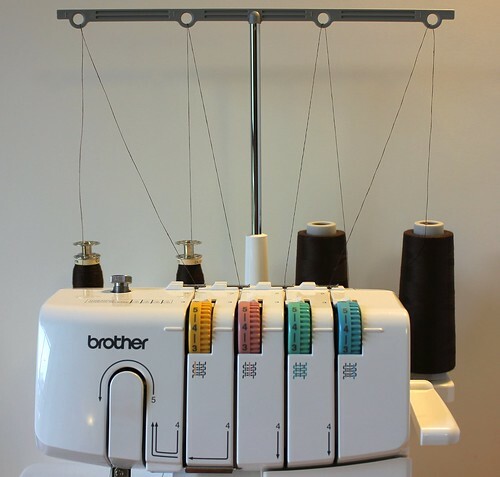 Thanks for sharing, I use bobbins, to thread my machine with, for colors that I don’t use often. Forget the serger…I buy the cones for my regular sewing machine and have made all kinds of devices and contraptions to use the cones, some work better than others, but this is revolutionary!!! The cones are so much of a cost saving over the spools and I can go through spools like crazy on a quilt. Sometimes it can be such a fight that it is almost not worth the savings. almost. I am so excited over this I may have to go sew a quilt tonight. Oh, right. I am. And the storage inside the cones?? Happy Dance. Thank you. Thanks so much… I will definitely be trying this great idea! Thank you so much for this! I recently bought my first serger (I’ve had it for a few days but haven’t opened it, there will be a grand ceremony for it’s christening) and the one thing I didn’t anticipate was the amount of cone thread I would have to invest in especially since I don’t sew in black or white a lot, I’m one of those neon lovers. This is the PERFECT hack for saving money! You’re wonderful! I have a huge basket with a lid that is overflowing with serger cones. This tip is the greatest idea ever. Thank you. I would like to add a little about Maxilock Serger thread. I might just be unlucky, but I’ve bought several cones where the thread has been cut or broken in places throughout the spool. One time when I took the plastic off, you could see many cut threads hanging from the bottom of the cone. When I took that one back, no questions were asked. I asked for a refund. I don’t think they were surprised. Needless to say, I don’t buy that brand anymore. This is awesome. Thank you so much! I was on a roll trying to get my son’s quilt finished when I ran out of thread. I did NOT want to make a trip to the store with my 3 kids for this one little, but critical, item. I happened to have a cone of white serger thread but couldn’t figure out how to use it on my sewing machine. This worked perfectly! J’habite à Aubagne en France. Je faisais la même chose mais avec les canettes. Maintenant j’adopte votre idée car elle est trop géniale. i like it very much!!.. Love this idea! Wish I had read this before I went out and bought 4 spools of lime green thread for a reversible shawl. Definitely had to match the color. Now I’m left with 4 spools I’ll probably never use again! Brilliant! Some girls like you can think outside the box, very clever. Thank you! That save sooo much money!!! Danke – das ist eine super Idee!!! Great idea! I am about to run out of one spool of white. I use coupons from Joann’s but it starts to add up when I need multiples. Was there a recommendation for interchanging the types of thread? Regular machine thread is too heavy for a serger. It can be used for special applications but not all the time serger thread is too thin for sewing machine. It may break and it is not strong enough to hold a good seam. Also it may affect the machine tension etc. Use the best quality thread you can buy for your machines and be sure to use the appropriate thread for different fabrics and applications. Your hack is a good idea but I would not recommend it. Thanks for listening. 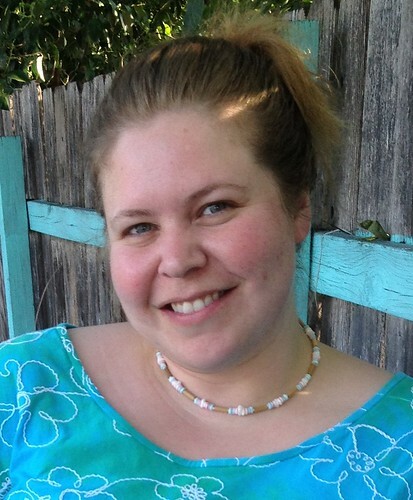 Lots of experience has taught me to be careful and you will love sewing as much as I do. Thanks, Elaine, for taking the time to share your thoughts and experience. I certainly agree that carefulness can be a virtue. I wonder if you read the above post? I clearly state the purpose for the serger thread hack, and using it on your sewing machine is not the intention. I wish you well in your sewing endeavors though, whichever thread you choose to use! Not you, but several commenters stated that they use serger and all-purpose thread interchangeably. I was glad to see Elaine set the record straight. I have barely used my serger because I haven’t had time to get comfortable with it, so I read a book on serging, and that was one of the things I learned. And I was one who was concerned about the expense of buying 4 cones of every color, so I really appreciate this tutorial, as well as the advice that not all 4 threads show, so they don’t always have to be the same color. Love you ideal Susan! But I’ve been told not to use serger thread for the top thread because it is much thinner than sewing thread and will break easy. But that I could use it as bobbin thread? Anything to that? Good idea, but I rarely ever change the colour of the looper threads, Usually change the left needle thread, sometimes change the right needle thread. Who cares what colour is inside if it can’t be seen. Ahhh this is so useful! Thank you for sharing. Can’t wait to try this out with my serger. I’d love to start right now but alas I’m in the middle of a move. I don’t think my husband would be to happy if I started tearing the boxes apart to get at my machine! Lol Thank you so much for sharing. Thank you so much. I always waste to much thread because I don’t use it fast enough. This will definitely save me money. What a totally brilliant idea! Thank you so much for sharing with us and I will definitely try it and pass it on to my sewing friends. You’re a genius. I love it. Thanks for share. WOW! I have been serging since the beginning of time…I have NEVER thought to do this…Thanks so much for education us experts. I have a baby lock model bl3-408. Bought 2nd hand, having had no previous experience. It constantly breaks thread. I have replaced needles, and it continues. Any thoughts? Moonthirty, I love your idea! I wonder, though, if there wouldn’t be problems from the thread twist coming off the spool in the wrong direction. If so, I guess there would be nothing to stop me from winding it off the first hacked spool onto a second one, which would send it back around the way it was intended to feed. Another concern I have is that some of the newer machines wind bobbins so fast that surely the thread would cut your fingers. Maybe it would be possible to feed it through a plastic yarn needle to protect your skin. I’m definitely going to try this. Rarely use the serger because I’m a quilter, but there are times when it would be great. I bought some bargain serger thread when I got the machine a dozen years ago and the plastic cones are starting to disintegrate, though the thread still seems strong. Rosalind, Please don’t use bargin serger thread on your machine. I did the same thing & had to keep taking my machine in to get it fixed. The repair place told me if I would quit using junk thread on my serger it would work just fine. She said that it left a residue on the tension disc’s & to only use “good” thread. I followed her advice & never had to take it in to get it fixed again. Sewed with it for many yrs til it totally died. Sometimes we save on the wrong end. I loVe this!! you’re a genious!! Silly me but I was wondering what the purpose of the glued bobbin is? 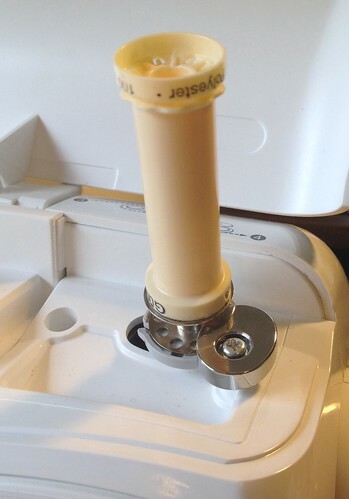 By gluing on a bobbin you are able to put it on the “winder” of your sewing machine. Thanks for that great tip. I have a cabinet full of cone thread, but now there is a solution! Brilliant idea, will try this, would it be ok to ask if someone would have an instruction book for a Husqvarna 350 they could give me.. Just got my machine out again and need some help with tensions etc. Thank u. Look online. You can download most instruction books. I managed to find one for my 40+ year old machine . What a genius idea. I love it. Thank you for sharing!!! Thanks! We moved and I left my serger thread, a huge box, behind. Mistake! This is just exactly what I need. This is such a clever idea. Thank you…..wish I had seeing this a long time ago. I too a serger class at UNH and the teacher said that gray is a neutral color and to use that with anything you want to serge and it will blend in. It works for the most part. Brilliant!! I found this hack just in time… I will be pulling out my serger this evening to fix seams on a whole pile of costumes for our church’s Live Nativity we’ve put on for the past 40+ years. These costumes have been used for so long that it’s not surprising they are coming apart at the seams!! Now I don’t have to worry about having enough matching thread!! Thank you!!! Great idea. Thank you. Cute video, too. This tip from the place I bought my serger was a really good thread saver. Buy two or three spools of light gray, medium gray and dark gray for serging with light, medium and dark colors. Buy only one spool of the color you need to match the fabric. If you mostly serge with three threads you can get by with two each of the gray shades or three each if you need to use four threads. Gray is also good on its own for an unusual color. Thank you for sharing the idea. I have often thought of trying some thing like that but wasn’t sure if it would work. Now I know. I was just putting thread on the bobbins and using them for serger, only for the needles as the loopers use a lot. Now, I don’t have to buy as many spools either. OMG!! Genius! Thank you so much for posting this!! You have saved me a ton of money! Wow!!! Thank You sooooo much! Try a regular empty plastic spool like Coats and Clark, all sizes. These will have channels through which something may be threaded. I do not tie up a bobbin forever. Attach the spool to the bobbin with twist ties( the kind that come on the bread bag) or 2 or 3 pipe cleaners instead of glue. Try to keep the spool pin holes of the bobbin and the empty thread spool aligned as much as possible. This wobbles a little on my Side Winder, but with care, it winds well enough. After thread is wound, the bobbin may be attached to another spool… and so on. I buy ONE cone and fill three old spools for my 4 thread serger. The loopers get the cone and the biggest rewound spool of thread. Thank you susan. Great job explaining!!! Loved your pictures too! Awesomeness!!! Genius! Way to put those brain cells to work! That is a super cool idea. I have black, white, grey, cream and navy but I balk at buying others. Unless Lidl are Selling them cheap! If I am making anything very special then I sometimes buy 5 spools. 1 for the sewing machine and 4 for the overlocker. I just put the regular thread in a coffee mug or juice glass behind the serger, thread up through the tall arm and down as usual. I’ve never had a problem doing it this way. You have to make sure not to put the end up of the spool where the little slice is to hold the end of the threat.. that would catch the thread and stop the whole process. Thank u so much this is a great solution! What a great idea! I use a serger on almost all my projects. I haven’t seen this yet and I’m so glad I came across your post! I love this! The storage idea of putting it inside the bigger thread is even a more brilliant idea! Thanks so much! Amazing, never looked but now I can do this too. No more lugging big spools! 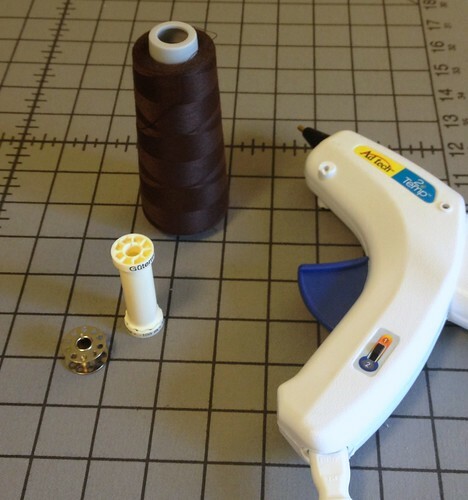 I have been doing this for years WITHOUT the hassle of the gluing the spool to my bobbins. The spool just fits on my bobbin post and winds perfectly . Works just as well for my embroidery machine too especially since embroidery thread is so expensive. I just tried. And I loved it ! Even more, I glued the other side of the Gutermann thread spool to the bobin so once the spool is made, I can remove this part and re-use it on another spool. This way, I glue only one of my (rather expensive) bobins. Thanks ever so much for the tip ! 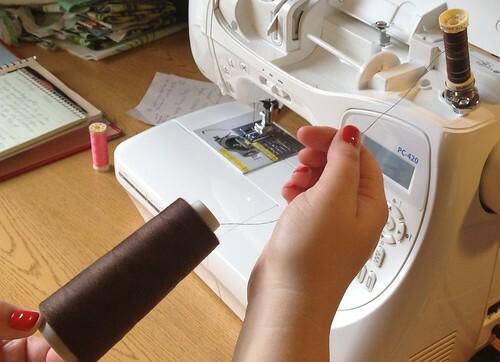 You can also use regular spools of thread on your serger. For those new to servers, there are free You Tube tutorials on how to thread, etc. Just about everything. I use them a lot. I have never seen this before. It worked great!!! Thanks so much! Thanks for the tutorial, Cannot wait to tell the ladies at work. What a great idea. Can I use this in my newsletter? DEFINITELY a hack i’m gonna use!!! Some regret not having sought out this economic solution when I was buying fashion colors!!! Ah well, live and learn!! Wow..this is so timely as I have lots of sewing on my list this year. I love when I can use the appropriate color on each project. Thank you! Una idea fantástica. Muchas gracias. Nunca lo hubiera pensado.